The Honeywell Hyperion 1300g is a linear imager with especially professional reading performance. It is based on the power and robust construction of the 3800g – one of the best-selling scanners of its class. Its highly efficient scanning ability, high durability, as well as simple handling make it predestined for the most varying applications in POS, in the office, repair shop, warehouse, shipping or in technical production environments. 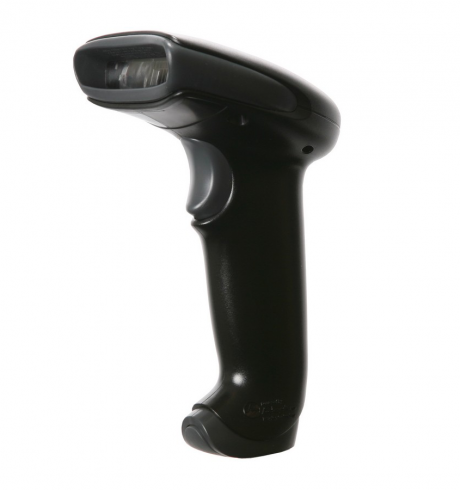 This scanner is as robust as it is fast in barcode data capture. Rely on especially secure data capture, even from poorly printed, wavy or smeared barcodes, thanks to its high definition linear imager camera. With up to 270 scans per second the Hyperion 1300g reads all 1D and GS1 DataBar codes. Its intuitive and utmost professional handling of standard codes reduces the need for additional equipment. Thanks to imager technology, there is no moving mirror optics, thereby reducing components to a minimum and ensuring a supremely robust construction method. Boasting the IP41 rating, it even easily survives multiple impacts on concrete. Its ergonomics are as impressive as its reading performance: its casing and trigger have been designed for comfortable use by both right and left handed users. Both its light weight and gun form keep its user from tiring quickly. An optional scan stand allows for hands-free scanning from two positions. Picture modification software offers additional editing functions for high quality digital pictures, such as cropping, enlightening, rotating, improved sharpness and much more. Additional intelligent software features optimise the reading and transferring of data, as well as support you in its integration into existing systems. Its multi-interface makes connection child’s play, plus its automatic recognition makes manual tuning passé.